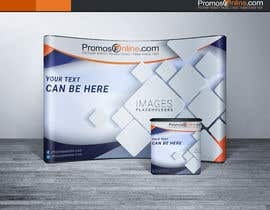 We're looking to have a 6' x 10'w FLAT (not curved) backdrop banner made for an upcoming trade show for our company, PromosOnline.com. 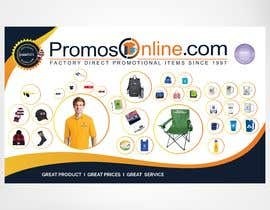 We have about 35 - 40 products we'd like displayed on the banner, along with text & our company logo. 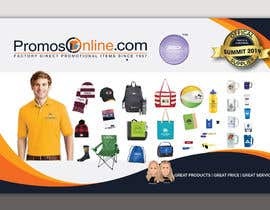 We'd like the design to be professional, eye catching and a design that shows trust in our company. 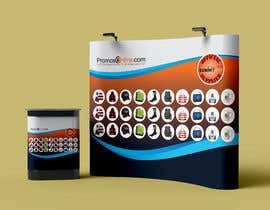 We will supply the images, but we need them laid out professionally and made into a beautiful backdrop banner. Similar items should be placed near each other (hats near hats, bags near bags, etc). 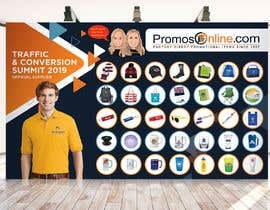 Since our images are hi rez jpegs on white backgrounds, the products can be placed into white circles, squares or octogons, so that the rest of the banner is color. Our colors are orange and navy blue, but feel free to be creative. We'd like the background to be colorful and professional, using gradients, shading and waves. 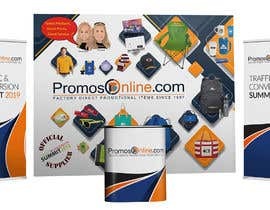 Images of brochures with green and of existing banners shown are for illustration only of how we like the waves and gradients. Do not used these images as a template for your work. Output file should be Camera ready, 1/8 " bleed, in .ai or .eps. layered file, 6 feet h x 10 feet W.